Vicious, freezing winds, insanely-steep terrain and a whole lot of heather-bashing… our athlete Orlando Edwards reflects on his outstanding victory at the Carnethy Five Hill Race, one of the biggest off-road events in the UK. The Carnethy Five Hill Race is one of my favourites. It’s relatively short at six miles but with five steep summits (a total of 762m of ascent) and a number of leg-buckling descents to tackle, the race is definitely a brutal one. It’s also the first real big race of the season and always attracts a large, strong field. This year was no different with 500 runners hitting the startline. Carnethy is the highest of the Pentland hills, a range just outside Edinburgh, Scotland. Once again this year, a traditional piper played the bagpipes as we tore away from the start and raced at speed across the first field. Conditions were good -that is if you don’t mind contending with a sub-zero chill factor wind, icy cold bogs, knee-high heather and snowdrifts! Things didn’t start well. I tumbled in the first bog of the day and lost ground on my rivals. I picked myself up and worked hard to get back to the front group. As we hit the bottom of the first climb (Scald Law), Tom Owens, and then my inov-8 teammate Rob Jebb, took turns in the lead. Running into a ferocious wind, it felt like we were being blown back down the hill. That, combined with the knee-high heather and snowdrifts, made it a gruelling first ascent. Once over the summit, I took huge leaps on the descent to try and land on the bits of terrain not covered in snow. The superb grip of my inov-8 Bare-Grip 200 shoes gave me the confidence to push myself harder. The next three summits (South Black Hill, East Kip and West Kip) came and went quickly, with a big group of us, including the 2013 winner Finlay Wild, still together at the front. On the long descent off West Kip, Finlay, who is renowned for his ability to run downhill, made his move. In general, my main strength is uphill running, but there was no way I was letting Finlay get too far ahead. I chased hard as we headed into the valley, both of us really letting it go and attacking the course, despite the treacherous underfoot conditions. As we reached the foot of Carnethy, the last big climb reared high above us. Finlay messed around taking his jacket off and seemed to slow a bit. I took the opportunity and worked hard to close the gap to about 25 meters. This was it. Race on. I put my head down and got stuck in. With the wind at my back, I switched into climbing mode, and eventually drew level with Finlay. Once side-by-side, I made my move. I ran hard, daring not to lot look back. I knew I needed to open up a decent sized gap before the final descent to the finish. On reaching the summit, I accelerated again and began the roughest, toughest descent of the whole race. Lifting my tired legs up and over the knee-high heather, I momentarily headed off in the wrong direction before correcting myself. 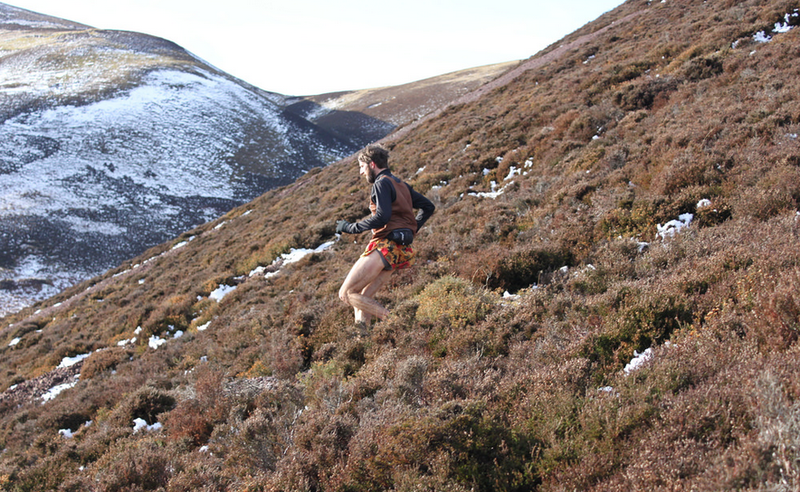 Knees up, knees up… I kept telling myself the same thing as I hit another section of thick heather. I swear it attempted to trip me up, but, sensing the finish was near, I crashed my way through it. Knowing that Finlay was pursuing me, I had no choice but to keep pushing hard, even in the scree section, which, as it turned out, proved a pleasure to run down, as it was heather-free! Just as I allowed myself to think about winning, I heard a spectator shout ‘the race is on, lad!’ I afforded myself a glance behind and saw Finlay about 35 meters adrift, flying downhill at an alarming speed. By now, however, I was almost at the bottom of the descent and knew there was just one field, albeit an extremely boggy one, to go to the finish. Avoiding the bog that had eaten me up near the start, I put the hammer down and charged for the line, where the bagpiper once again greeted me. I remained committed right until the end and was, of course, delighted to win the race, especially against so many top runners. * Orlando was one of three inov-8 athletes to finish in the top-10, with Rob Jebb fourth and Tom Addison seventh. * inov-8 athlete Sarah McCormack, wearing X-Talon 190 shoes, won the women’s race. * Results and race report on Mud, Sweat and Tears website. * Photo sets on Carnethy Hill Running Club website and here.